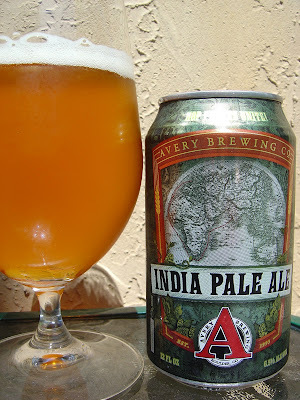 Today I'm drinking Avery India Pale Ale brewed by Avery Brewing Company in Boulder, Colorado. I looked for a long time, but surprisingly, I've never tried this beer before, or at least I didn't write anything down. This beer just arrived in its new packaging, a 12 ounce can. I'm not sure how I feel about cans yet. If you always pour into a glass, then it doesn't matter. I do always do that for my reviews here, but sometimes when I'm drinking for fun, I don't. And that's when I prefer a bottle by a lot! There is a little story that ends "Brewed by hop heads, for hop heads." And they take it further around the rim of the can with "HOP FREAKS UNITE!" The illustration is of a map of the world. Not sure what the stamps on the bottom of the can mean but if 11076B6 11:33261 mean something to you, terrific. Fruity peach and lemony citrus aroma sweet and bitter at the same time. Lemony flavors start, bitter but nothing outrageous. This beer is, however, very dry. Fruity sweet takes a turn but this is an easily bitter beer throughout. Lots of pine and citrus and grass really stand out in a classic IPA. Good carbonation. Nice beer! Your 6.5% alcohol is mostly hidden except for it's role in drying out your palate. Liked it. I didn't think I was going to like beer out of a can until I tried Dale's Pale Ale. I'll add this one to my list of beers to try. I'll go looking for this one. Cans are great for the beach or pool. I do prefer bottles though b/c I like to drink from them sometimes and a can just doesn't do that for me. Anyway, about this beer, yeah, very nice.